This is a character portrayal of Baal. Were you looking for Baal the Diablo II monster? Baal is one of the three brothers who make up the Prime Evils, along with Mephisto and Diablo. He is a major figure in the world mythology, and features in several of the Diablo Novels, and is the main antagonist in the expansion to Diablo II, Lord of Destruction. Baal is the Lord of Destruction, and is inherently evil. In his existence before being imprisoned in the body of Tal Rasha, he was described to be brutish, but seems to indeed have taken on some of the powerful Horadric mage's intelligence after the imprisonment. On encounters with both Marius and the Barbarians, he acts rather playful and sly with a dry sense of humour. It's been debated whether or not Baal is left handed, as he uses his left hand to do a variety of things, including killing Marius, using it in his conversation with the Barbarians. Baal has a few behaviourisms that sets him apart from his two brothers, Mephisto and Diablo. He could have just killed Marius when he found him, taking the Soulstone but instead fooled him with the guise of Tyrael and listened to his tale. While this might have been a move to make sure Marius had not hidden the stone elsewhere (forever hiding its location if he was killed), it could be that Baal likes to play with his prey before destroying them. His appearance looks like he has taken the facial skin of Tal Rasha and attached it to his demonic head. Baal has been around for much longer than the world of Sanctuary. Together with his brother Prime Evils and servant demons of the Burning Hells, they have battled with the High Heavens for aeons. When Sanctuary was created, the brothers realized that the world held potential for vast power and the possibility of once and for all defeat the High Heavens, and turned their attention towards it. The treacherous Lesser Evils rebelled, and overthrew the brothers, trapping them on Sanctuary. Thus began the Sin War. Tal Rasha led the campaign for hunting down and capturing the Prime Evils, including Baal during the Sin War together with Jered Cain. When the Prime Evils were exiled from Hell into the Mortal Realm by the Lesser Evils a group of mages brought together by the Archangel Tyrael organised themselves in order to defeat them and bind them to Soulstones which were provided by Tyrael. They called themselves the Horadrim. After finding and capturing Mephisto in Kehjistan's jungles, burying him under what later became Kurast, the Horadrim chased Baal across the ocean to the Western continent, in to the Aranoch desert. Tal Rasha presumed Baal was heading north toward Scosglen, but mysteriously the demon changed its path and took refuge within the desert city of Lut Gholein. Tal Rasha ordered his team to hold the attack and to patiently await for Baal to continue his escape. Three days later, Baal fled Lut Gholein heading to the north, as Tal Rasha had predicted. Baal playing with the Barbarians. A few miles into the desert, the adventurers caught up with Baal and attacked him. The demon unleashed the fury of his powers upon the men. The earth exploded under them and swallowed many men. Fire erupted from the broken earth burning everything and everyone on its path. In a desperate attempt, Baal hurled a spell at Tal Rasha unsuccessfully. Unharmed, but at a price, Tal Rasha rose from the earth to find the Soulstone given to him by Tyrael had shattered into small shards. The men pressed their attack and defeated Baal. Tal Rasha walked toward Baal's battered body and slashed his throat jamming the largest Soulstone shard into his open wound. Baal's spirit was sucked into the shard, trapping the demon. Archangel Tyrael appeared before the men and led them toward seven ancient tombs deep in the desert. There the men were instructed to build a binding stone etched with runes of containment. They magically crafted unbreakable chains to secure the binding stone to the chamber's walls. Tal Rasha ordered to be chained and bound to the stone. To everyone's astonishment, Tyrael jammed the shattered Soulstone into Tal Rasha's chest, allowing Baal's spirit to flood into his body as host, thus completing the prison, dooming Tal Rasha to struggle for eternity against Baal. The other six tombs became resting places for other powerful Horadrim mages, and acts to some degrees as decoys in the Canyon of the Magi. The Horadrim pushed on to attack and capture Diablo, imprisoning him in what would be Khanduras, creating a Horadric Monastary on top of the demon's prison. 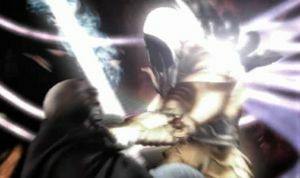 The Wanderer fighting Tyrael in order to free Baal. Centuries later, Diablo freed himself and travelled in the guise of the Wanderer to the Aranoch desert with Marius to free his older brother. As the two reached the Tomb of Tal Rasha, Tyrael caught up with the pair and attacked the Wanderer to prevent him from freeing his brother. Baal lured Marius with a facade image, asking for help. Marius could only see a poor man bounded by chains, impaled by an object on the chest. Tyrael's gaze turned around toward Marius, and he called out to him not to pull the shard out. Marius grabbed the shattered Soulstone shard and pulled it free from Tal Rasha's body. Drognan and Fara of Lut Gholein claimed Baal after this now had unrestricted access to Tal Rasha's knowledge and powers. Tyrael left the Wanderer to tell Marius he just ensured the doom of Sanctuary and told him to go to the Temple of Light, in the eastern city of Kurast. He should enter the gate to Hell and take the stone to the Hellforge to destroy it. He unfortunately did not do so, and later ended up in an insane asylum. After some time, Baal found Marius, and once more lured him. He took the guise of Tyrael and Marius gave away the soulstone shard to Baal, who revealed his true identity and killed Marius with Festering Appendages. He then set the asylum on fire as he left it. Baal then began the assault on Mount Arreat in order to corrupt the Worldstone hidden within. The regular demons and poorly disciplined Earthly mutations the Prime Evils had used in their initial invasion was not a bunch Baal had much trust in when battling the mighty Barbarian tribes, so he gathered some of his most powerful minions from the depths of his domain. 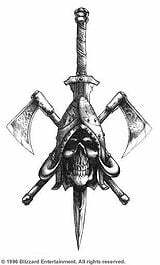 He began by attacking the capital of Sescheron, and left a trail of destruction all the way up to Harrogath, which in the last minute was saved by powerful magic added by the Barbarian Elders. Town Elder Nihlathak betrayed the village and gave the Relic of the Ancients to Baal to let him enter the Worldstone Keep unchallenged by the Barbarian Ancients. A group of adventurers caught up with the Prime Evil and defeated him, but not in time to stop Baal from corrupting the Worldstone. Despite the victory, the Worldstone, was beyond saving and Tyrael had to destroy it. The resulting explosion wrecked the Barbarian lands and left a massive crater where the ancient mountain once stood. Exactly what has happened to Baal, and where he would be if he's still alive in some shape is unknown. Baal was not seen in Diablo I, but he was mentioned in the world lore, both in the game itself and in the lore-filled manual. Baal in Diablo II: Lord of Destruction. Baal featured prominently in Diablo II, appearing in the cinematics and plot, though he was not found as a defeatable monster in that game. Baal, the boss of Act Five. Uber Baal, a more powerful version of the demon added as part of the Pandemonium Event, a special realm-only quest added in v1.11. Full view of Baal's head. Baal's own breed of demons. Artwork for Baal as shown at Blizzcon 2011. This page was last edited on 27 May 2012, at 03:15.